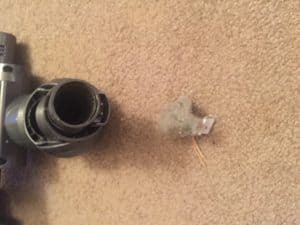 I had two vacuum heads for my Dyson DC-44 Animal stick vacuum cleaner. A while back, one started making funny whubba whubba noises, and then the stick would turn itself off. Silly me, I thought it was the vacuum head that had broken, and switched to using the spare not realizing it was a simple answer. Well, right before Thanksgiving, it started making those noises too. I was so bummed at the thought of having to buy a new stick vacuum. Then I was happy thinking of the sales. Then I looked at my bank balance. Ready for the Simple Answer? The connector tube was clogged. Thus the stick couldn’t generate a vacuum and Dyson programmed in for it to shut itself off if it couldn’t. I found some really long tweezers that I use when sewing with my serger and cleaned it out as best I could. There’s more to do, but after doing some initial cleaning of large clumps of cat fur, the stick could generate a vacuum again and I was able to finish cleaning the carpeting and save money. I need to do more and will be researching how. When I figure it out, I’ll update this post with pictures so you can clean out your vacuum head too. Until then, I couldn’t get a chopstick to work. Try to find some long tweezers so you can figure out what’s causing the clog.